For those of you who have been around since the beginning… A couple years ago I went and had a cauliflower kick. (Oh my gosh, I’m just now realizing that the recipe for cauliflower alfredo and this recipe are nearly identical…cauliflower is so versatile! HA.) 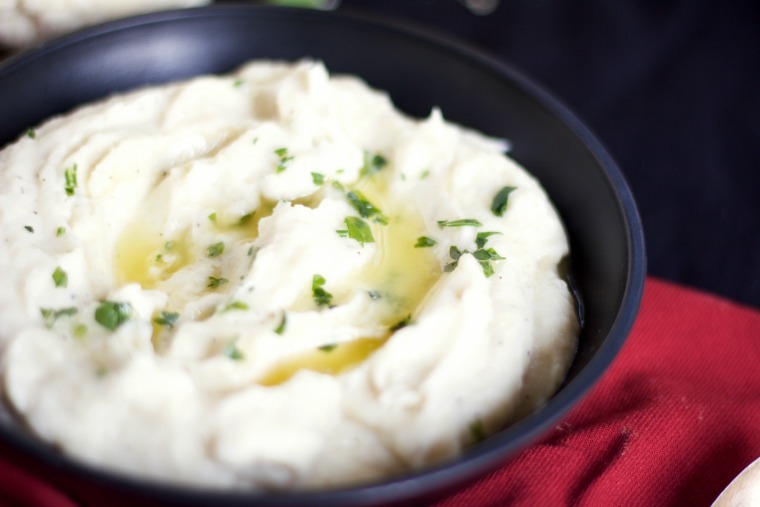 One of the things I tried to make work cauliflower mashed “potatoes.” They didn’t make it on the blog… They still felt mealy and I had to doctor them up with a lot of butter. But it turns out, I just wasn’t patient enough. I have made the ultimate mashed cauliflower. It’s very simple. Boil the cauliflower in your favorite broth. Chicken broth (how about your own bone broth?) makes it smell especially potato-y for some reason. 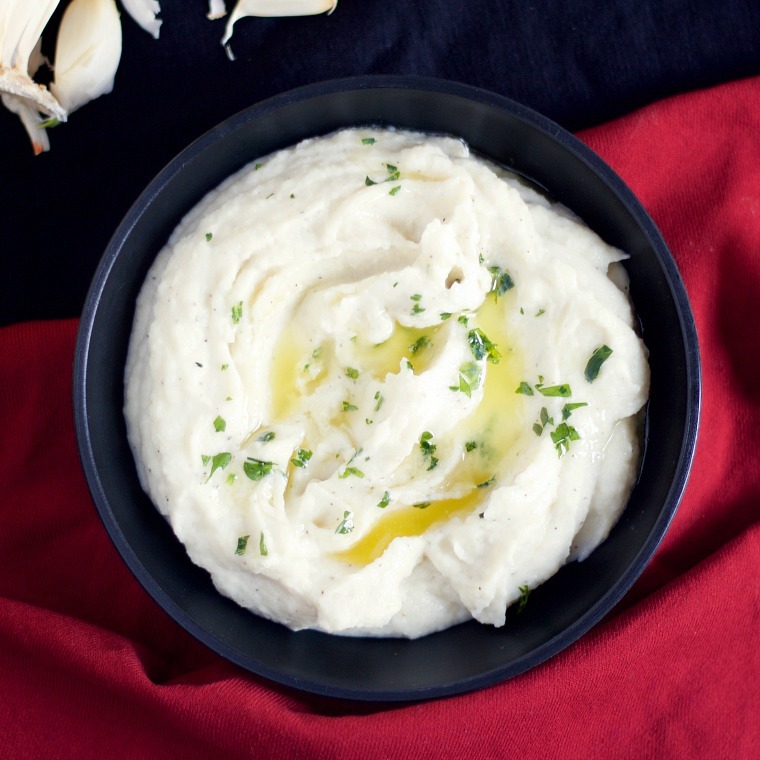 Put the cauliflower in a food processor and blend until smooth. Then you just blend in other delicious flavors and voila. I think that if you serve it hot and immediately, you could fool the best of them that they’re potatoes! 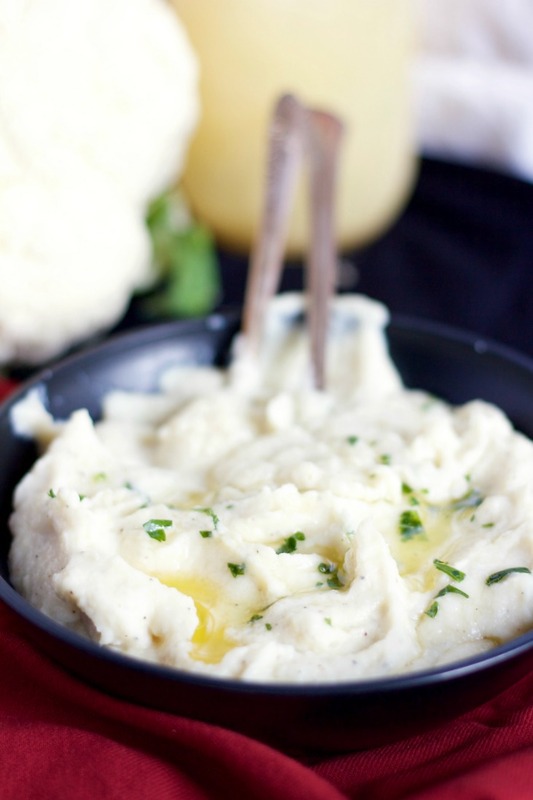 Cauliflower: this mashed cauliflower recipe! Green beans & Mushrooms: I made a veggie and rice teriyaki bowl. Grapefruit & Oranges: I gave to Justin because he likes to eat them for breakfast. Bananas: I mashed them for an upcoming recipe! Lettuce & Arugula: I gifted most of my leaves to other people, especially since it was just me at home this particular week, I didn’t really have time to eat it all. Sweet Potatoes: I still haven’t done anything with them! Excited to make something this weekend maybe! The bag I got was called a variety bag, so it includes some “non-local” things (the bananas and oranges, in this case). You can also update your bag to include things like meat, milk, and eggs. They even have a new subscription for beautiful flower arrangements from my favorite place, Ever Something (I might have to work it into the budget). 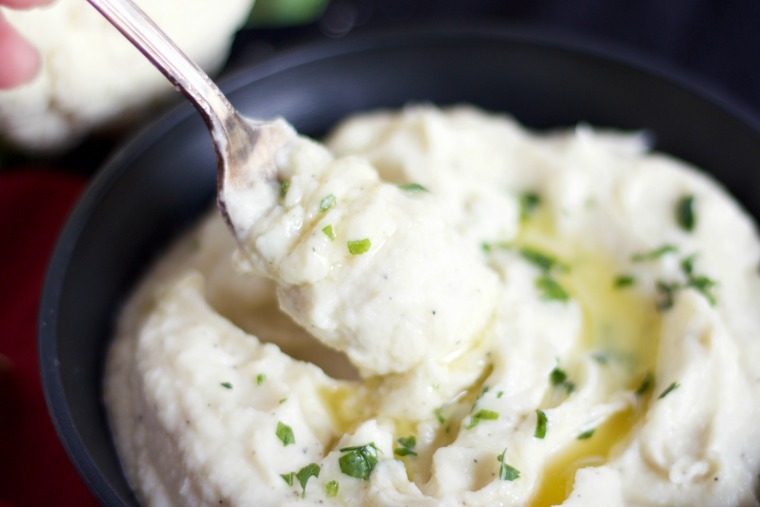 Have you tried cauliflower as a potato replacement? Do you think it tastes the same? Close enough? 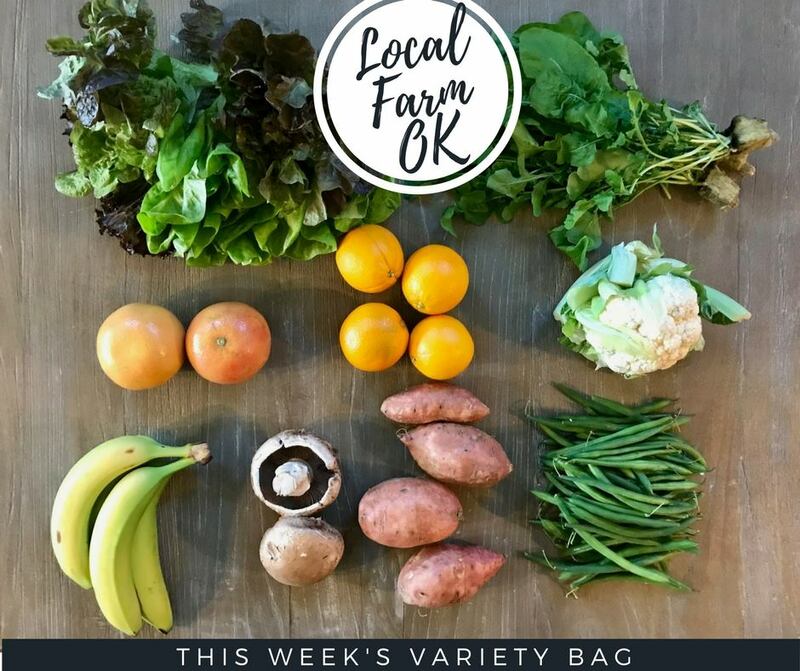 Do you get a Local Farm OK bag? Tell me what you like to do with all your lettuce! Let me know what you think! Cut off a small amount of the top of the garlic head, making sure to expose each clove. Pour 1 T. of olive oil over the exposed clove and wrap the head in aluminum foil. In an oven at 350 degrees, roast garlic for 20-30 minutes, or until fragrant. Let cool, and then push out the contents of the clove out of the dry garlic wrapping. Mash with a fork, and set aside for later use. Cut cauliflower off the head into florets. On medium heat, bring chicken broth to a boil. Add in cauliflower and boil for about 20 minutes, or until florets separate when poked with a fork. Spoon cauliflower into a food processor (not including broth). Blend until smooth. While it’s whizzing, cut in butter, yogurt, and garlic. When well combined, taste and add salt and pepper accordingly. Time reflects garlic already pre-roasted, as an ingredient. Naturally Gluten Free and can be modified to vegetarian if using vegetable broth.